Home Unlabelled Pres. Duterte to UP protesters: "I’ll give your slots to those deserving bright lumads"
Pres. 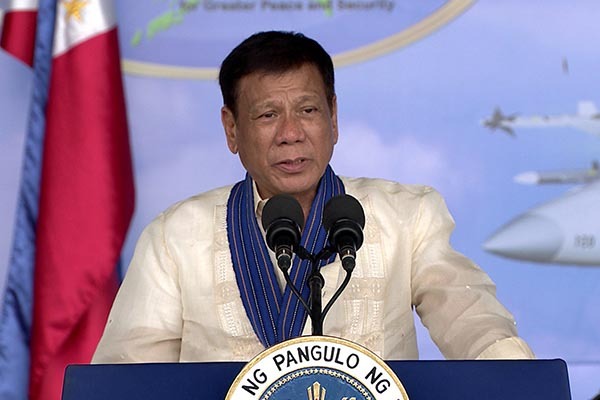 Duterte to UP protesters: "I’ll give your slots to those deserving bright lumads"
President Rodrigo Duterte on Thursday warned students of the University of the Philippines who keep on “walking out” of their classes to join protests that he would give their slots to deserving lumads. “Kaning UP sige ug walk out, ganiha ga-walk out. O sige. Kamong dili mang-eskwela, hawa mo dira kay dad-on nako ang mga natibong bright ngare, mao akong ipabutang diha. Daghang Pilipino gusto edukasyon nga gwapo,” Duterte said at an indigenous peoples summit in Davao City. “So kanang sige ug demonstrate, ayaw mo ug walk out sa kwarto. Tagaan tamo ug privilege, one year ayaw mo ug eskwela kay pasudlon nako tanang Pilipino nga wa makapalad makagwapo ug—libre diha,” he added. [These UP students who keep on walking out, earlier, they walked out. Okay. Those who don’t want to go to school, get out because I will bring the bright lumads there, I will enroll them there in UP. A lot of Filipinos want a good education. "UP, gusto silang mag-walk out. I encourage them. Do not go to school anymore. Dira mo sa dalan. Sige! Kay magkuha ko ug bag-o, ibutang nako dira. Tutal kwarta man na sa tawo [Stay there in the streets. Go ahead! Because I will get new ones, I will put them there. That's the money of the people after all]," Duterte said. 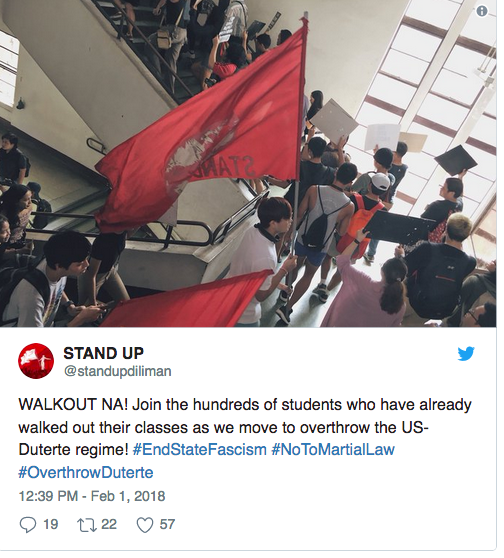 “While fascism was on our plates for breakfast, this lunch we are serving resistance as we will walk out from our classes to protest the tyrannical dictatorship of the US-Duterte regime,” a post on its Twitter said.